The world around us is mainly constructed of baryons, particles composed of three quarks. Why are there no antibaryons, since just after the Big Bang, matter and antimatter came into being in exactly the same amounts? A lot points to the fact that after many decades of research, physicists are closer to the answer to this question. In the Large Hadron Collider beauty (LHCb) experiment the first trace of the differences between baryons and antibaryons has just been encountered. In data collected during the first phase of operation of the Large Hadron Collider the LHCb collaboration team has discovered an interesting asymmetry. The most recent analysis of decays of the beauty baryon Lambda b, a particle six times more massive than a proton, suggests that it decays a little differently than its antimatter counterpart. If this result is confirmed, it will be possible to talk about having observed the first difference between antibaryons and baryons, i.e. the family of particles which to a greater degree make up our everyday world. 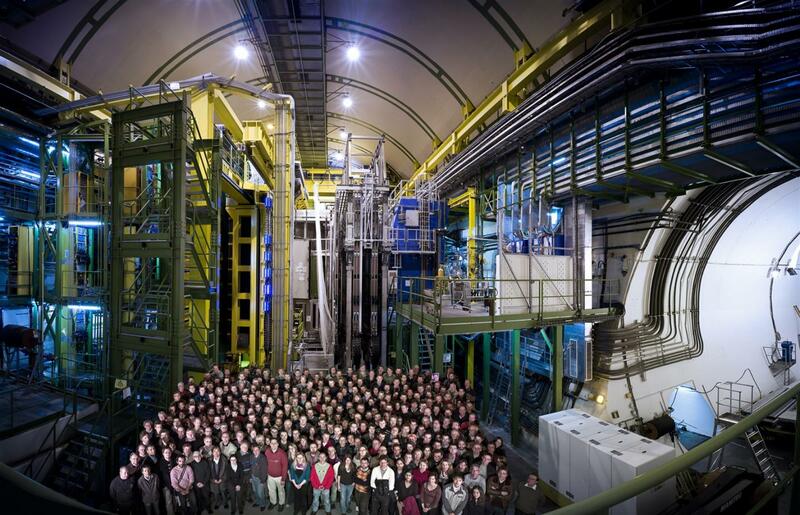 The first trace of differences between matter and 'common', baryonic antimatter has just been encountered in decays of the beauty baryon Lambda b. Pictured above: LHCb Collaboration in front of LHCb detector. Certain differences between matter and antimatter have already been observed previously. In 1964, it was noticed that kaons - that is, K mesons, particles made up of a strange quark and an up or down antiquark - sometimes decay somewhat differently than antikaons (the Nobel Prize was awarded for this discovery in 1980). In turn, in recent years there have been reports of the discovery of slightly clearer differences in the decays of antimesons and B mesons of various types (the B meson consists of a beauty quark and an up, down, strange or charm quark). Mesons are quark-antiquark pairs with short lifetimes, appearing today in the Universe in small quantities, and on Earth, produced mainly in high-energy collisions in particle accelerators. Meanwhile the matter of which the macroscopic structures of our world are composed is made up of leptons (these include electrons) and to a greater degree baryons - clusters of three quarks (the proton is a baryon containing two up quarks and one down, as is the neutron which is composed of two down quarks and one up). The most recent analysis of data from the LHCb collaboration, published in the journal Nature Physics and concerning the decays of Lambda b particles composed of down, up and beauty quarks, is thus the first indication of the possible differences between baryonic matter and its antimatter reflection. "We cannot yet talk about a discovery. Nevertheless, we are dealing with something that seems to be an increasingly promising observational clue, taken from the data from the first stage of operation of the LHC accelerator. We will, however, have to wait for the final confirmation - or denial... - of the current result another dozen or so months until the official end of the analysis of data from the second run," stresses Prof. Marcin Kucharczyk from the Institute of Nuclear Physics of the Polish Academy of Sciences (IFJ PAN) in Cracow, one of the participants of the LHCb collaboration. Modern particle physics and cosmological models suggest that antimatter came into being in exactly the same amounts as matter. This fact is linked with spectacular consequences: When a particle encounters its antiparticle, there is a great likelihood of mutual annihilation, i.e. a process in which both particles completely transform into energy. This mechanism is extremely efficient. The amount of energy generated by the annihilation of a kilogram of antimatter with a good approximation corresponds to the amount of energy that would be released as a result of burning the annual petrol production of all the refineries in Poland. If in the contemporary Universe there were planets, stars or galaxies made of antimatter, they should emit large amounts of radiation with very characteristic energies. This would arise due to the inevitable interactions with matter of the opposite type, leading to annihilation. Meanwhile, astronomers only observe annihilation radiation here and there and in residual amounts, well explained by physical phenomena which are also today responsible for the formation of small amounts of antimatter. Thus the fundamentally important question arises: since originally matter and antimatter filled the Universe in exactly equal amounts, why have they not completely disappeared? Why has a small portion of matter managed to survive the era of annihilation? In the living world great extinctions leading to the extinction of species last for tens and hundreds of thousands of years. Meanwhile, everything points to the fact that antimatter annihilated by matter disappeared from our universe fractions of a second after the Big Bang. For every few billion particles of matter just one particle survived the giant cataclysm. If a similar scale of destruction touched the human species, within seconds the Earth's population would be down to one live individual. The question of why only he survived would certainly be most apt. "In modern physics, it is assumed that the existence of matter should be due to some minor differences between the properties of particles and antiparticles. In equations, to convert a particle into an antiparticle, you have to change the sign of the corresponding quantum characteristics - in the case of electrons or the quarks making up protons or neutrons it is the electrical charge - and change the character of the spatial coordinates, i.e. form a mirror image. The combination of these two operations is called CP symmetry, that is, charge and parity symmetry. Thus, attempts to detect differences between matter and antimatter boil down to tracking events in which CP symmetry is not preserved," explains Prof. Kucharczyk. Looking for signs of CP violation, the LHCb collaboration researchers chose from a huge number of collisions and the products of their decays approx. 6,000 cases in which Lambda b particles decayed to a proton and three pi mesons (pions), and approx. 1,000 cases with a decay path leading to a proton, a pion and two kaons. Detailed analysis revealed that the angles at which the products of decays diverge are sometimes somewhat different for Lambda b baryons than for their antimatter partners. The result is confirmed with a statistical significance of 3.3 standard deviations (sigma), which corresponds to a probability of approx. 99% that it is not a random fluctuation. In particle physics it is assumed, however, that one can talk of a discovery only with a statistical significance of over 5 sigma, that is, when the probability of a random fluctuation is less than one to more than three million. The Henryk Niewodniczanski Institute of Nuclear Physics (IFJ PAN) is currently the largest research institute of the Polish Academy of Sciences. The broad range of studies and activities of IFJ PAN includes basic and applied research, ranging from particle physics and astrophysics, through hadron physics, high-, medium-, and low-energy nuclear physics, condensed matter physics (including materials engineering), to various applications of methods of nuclear physics in interdisciplinary research, covering medical physics, dosimetry, radiation and environmental biology, environmental protection, and other related disciplines. The average yearly yield of the IFJ PAN encompasses more than 500 scientific papers in the Journal Citation Reports published by the Thomson Reuters. The part of the Institute is the Cyclotron Centre Bronowice (CCB) which is an infrastructure, unique in Central Europe, to serve as a clinical and research centre in the area of medical and nuclear physics. IFJ PAN is a member of the Marian Smoluchowski Krakow Research Consortium: "Matter-Energy-Future" which possesses the status of a Leading National Research Centre (KNOW) in physics for the years 2012-2017. The Institute is of A+ Category (leading level in Poland) in the field of sciences and engineering. Citation: "Measurement of matter-antimatter differences in beauty baryon decays"